It’s really hard to stop myself from using a refrigerator analogy for the art one finds at Alex Gold‘s back alley art space in Eastern Market. Something about there always being something satisfying in the fridge. There. I did it anyway. I really love what goes on at The Fridge. Saturday night’s opening of Laura Elkins’ White House Negligee was, of course, up to the Fridge’s high surprising and cookily cultural standard. 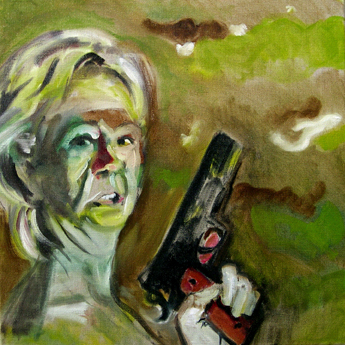 Elkins’ paintings are large nudes of various First Ladies, posed at a vanity, either sipping tea or brandishing firearms. They are visually arresting, to be sure. Then the thoughts creep in, Why is this so startling? Why do we venerate the First Ladies so strongly? What do we really know about them? Aren’t they human beings too? Besides being humanizing, the paintings are just funny. Elkins intends them to be current and not especially serious. Besides Eleanor, Jackie, Michelle or Hillary, the artist also paints the pattern of a print from the era of that First Lady: Mamie has fifties shapes, Michelle has flowers. It’s just an extra layer and adds to the curiosity. The show runs through January 30. The Fridge is open Wednesday through Saturday from 1:00 to 7:00. Talking to Alex can be your New Year’s gift to yourself. Nice talking with you too. Hope to see you on the 22nd for a discussion with the artist.